DONETSK, Ukraine -- The Ukrainian military on Sunday moved into the heart of the separatist hub of Luhansk for the first time, officials said, chipping at one of the cornerstones of the pro-Russia rebels’ disintegrating virtual state. Ukrainian servicemen guard a checkpoint near the eastern Ukrainian town of Debaltseve, August 16, 2014. 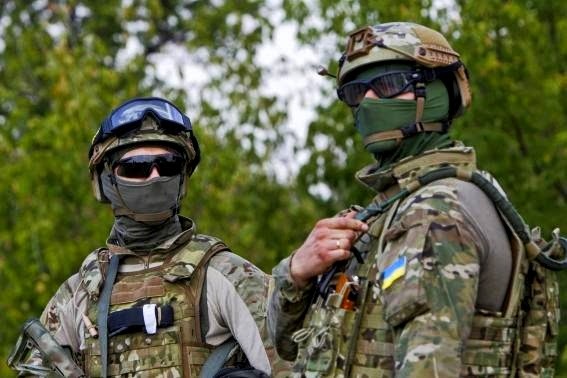 Ukrainian officials said army units had raised the national flag over a police station in central Luhansk, the eastern city that, along with Donetsk, has been a center of rebel activity and an important destination for Russian fighters and aid. Other parts of Luhansk, however, were still said to be under rebel control. The claim could not be independently confirmed, though a photograph of the flag and police station was circulating on social media, and the report was consistent with the progress of fighting there going into the weekend. Along with increased Ukrainian pressure on rebel positions in Donetsk, the army’s move into Luhansk focused attention on the profound reversal of the separatists’ fortunes since they declared independence in April. Interviews across eastern Ukraine portray a rapid breakdown in discipline in the rebel ranks. Many fighters have abandoned their uniforms in favor of civilian clothes, and three senior leaders have left the war zone in recent days. Even as Ukrainian officials in Kiev celebrated the developments, and as international foreign ministers met in Berlin to try to ease the crisis with Russia, there was increased worry that the Kremlin would take the rebels’ disintegration as an incentive to intervene more forcefully in Ukraine, perhaps setting off a wider war. “It’s a case of being very, very, very careful what you wish for,” said Cliff Kupchan, an analyst with the Washington-based Eurasia Group, speaking of Western officials who have endorsed the Ukrainian military option. If President Vladimir V. Putin of Russia believes “the rebels are about to get routed, we do have a problem,” Mr. Kupchan said. A large Russian convoy said to be carrying humanitarian aid to Luhansk remained at the Ukrainian border on Sunday, and movements there were being closely watched. Western officials have warned that pushing the convoy through would be taken as a belligerent act by Russia. In Berlin, the foreign ministers of Ukraine, Russia, France and Germany met to discuss a settlement to the four-month-old conflict, which Russia stoked after a pro-West government took power in Kiev in the wake of street protests. In a telephone call with the Ukrainian president, Petro O. Poroshenko, Chancellor Angela Merkel of Germany said Saturday that Russia should clarify a statement by the separatist prime minister in Donetsk, Aleksandr Zakharchenko, who claimed he had received reinforcements from Russia. Russia has denied sending soldiers or weapons into eastern Ukraine. Zakharchenko said rebels would receive 150 armored vehicles and 1,200 soldiers who, he said, had spent four months training in Russia. “They are joining at the most crucial moment,” Zakharchenko said. In a radio interview on Sunday, a spokesman for Putin denied Zakharchenko’s claim that a new supply of arms and fighters had been brought across the border from Russia. “We have said repeatedly that no equipment is being supplied there,” the spokesman, Dmitri S. Peskov, said in the interview on the Moscow Speaks radio station. Though the Kremlin has steadfastly denied supplying the separatists in eastern Ukraine, insurgent leaders on several occasions have spoken openly about support from Russia, and at times have complained about the quality of weapons and ammunition they received. Besides the advance in Luhansk, the Ukrainian military made another critical move, capturing the town of Yasinovataya, a strategic railway hub north of Donetsk. The army has tightened its siege on Donetsk in recent weeks, and inside, a breakdown in discipline among the hard-pressed rebel fighters had locals on edge. Residents said rebel fighters had taken to carousing drunkenly at night and wearing civilian clothes at checkpoints, a change that would allow them, at a moment’s notice, to throw down their weapons and blend in with the population. Ukrainian police at a checkpoint on Sunday reported capturing four separatists dressed as Orthodox priests, making their way toward Russia. And on Saturday night, rebels drunkenly fired pistols in a street outside the Havana Banana bar, causing guests to dive under their tables for cover. Earlier this month, three drunken separatists crashed a car into the curb outside the Ramada hotel, ejecting two people from the car, and on Saturday two separatists crashed at the same spot, rolling their vehicle and scattering shorn-off car parts, broken glass and bullets on the street. In an interview, a deputy minister of defense of the self-declared Donetsk People’s Republic, Fyodor Berezin, conceded that problems were emerging but insisted that the force could still defend the city. “You understand, hundreds of people got weapons and felt power, and didn’t understand it was for a purpose,” he said of the erratic shooting that has now become general. In recent weeks, as the Ukrainian military has steadily advanced against the rebels in the east, officials have often spoken about the possibility of creating a corridor that would allow insurgent fighters who had arrived from Russia to put down their weapons and retreat back across the border. The seemingly imminent defeat of the rebels also raised the possibility that the huge convoy of trucks waiting to bring aid from Russian to civilians in Luhansk and elsewhere in eastern Ukraine might also be used to carry fighters and weapons out of the country. During random inspections by journalists, a number of the trucks have turned out to be mostly empty, and Russian officials have not offered much explanation other than to say they were trying to account for the possibility that some trucks might break down. The convoy has been mostly parked at a military base near the border, but 16 of the more than 200 trucks moved closer to the line on Sunday, stopping near a border checkpoint. Officials in both countries said there was still no agreement to let the convoy cross into Ukraine. In the past week, three senior rebel leaders have left the war zone, in moves seen as setting the stage for a possible negotiated settlement by removing contentious personalities or Russian citizens from top positions. In Luhansk last week, the prime minister and military commander of the Luhansk People’s Republic, Valery Bolotov, announced in a recorded video address his “temporary resignation” as leader and departure for Russia for medical treatment. Aleksandr Borodai, a Russian citizen, stepped down and was replaced by Zakharchenko. Borodai later announced that a fellow Russian who had been the military commander, Igor Girkin, who uses the nickname Igor Strelkov, or Igor the Shooter, had also resigned and a Ukrainian citizen appointed in his place. Borodai said Strelkov had left the eastern Ukrainian war zone for a “vacation,” and would return.